Love this picture it is so sweet. My bestie and I call Addison and her son (he is one) kissing cousins. Made me think of them together. @ Rachel Joy This one cracks me up, he looks bewildered! 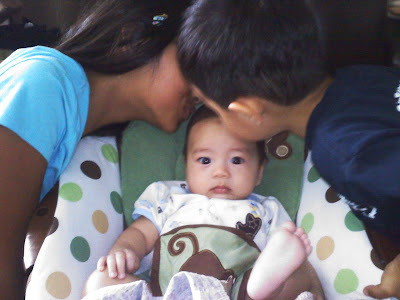 His cousins love him so much and always want to kiss him. @ mommysankey Attack of the cousin kisses! LOL. Our son looks a little confused. Kiddie kisses=cute! Thank you for your comments ladies! New follower from Bloggy Moms. So cute! That is a great expression! I'm Taking A Trip To Monte Carlo!